Ciena offers a 3190 multiservice delivery switch built to bring together carrier-grade Ethernet switching with scalable Pseudowire Emulation services for TDM and ATM network deployments. The robust platform allows the switch to sit anywhere in the edge or aggregation selection of your metro or core packet network, allowing for greater flexibility based on existing space, infrastructure and installation costs. Pseudowire encapsulation ensures that your carrier Ethernet delivery will provide multiservice traffic separation where your customers demand it. Selecting a used Ciena CN 3190 will provide you with easy transport and flexibility in transitioning to converted package infrastructures across existing network deployments. Each model can provide carrier-class QoS and OAM so that you always have enforceable SLAs across your entire network. 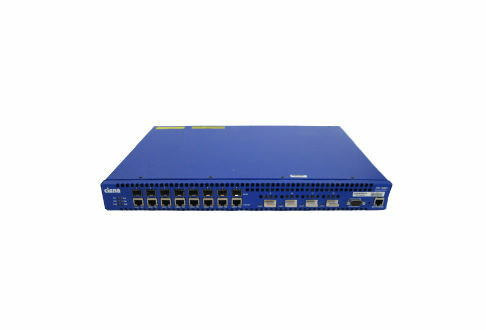 A refurbished Ciena CN 3190 from Worldwide Supply will offer T1/E1 over SONET or SDH grooming and transport over a packet switched network all within the same unit. Combined with low power consumption and high service availability, the switch gives you a redundant architecture that will improve operations in a compact 3RU footprint. Ensure your latest updates and upgrades work across your entire network with the Ciena CN 3190’s ability to migrate from TDM to Ethernet networks. You’ll be empowered with a platform that supports a full complement of carrier Ethernet and MPLS services for both mobile backhaul and business service transport. The unit’s 84 Gbps of bi-directional switching ensure you can manage the traffic you need, prioritize channels and pathways, protect packets and maintain proper network administration 24/7.